A Florida mom is speaking out about a traumatic experience she had at the doctor's office, while she was pregnant. Courtney Baker has a 15-month old daughter with Down syndrome. 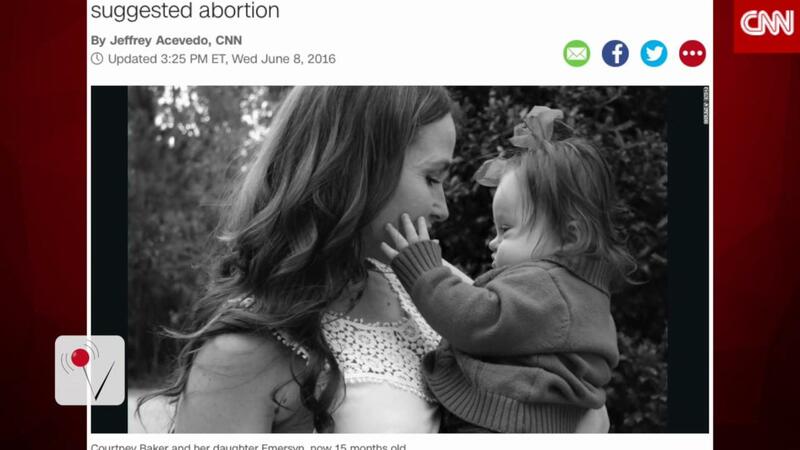 But when her baby was diagnosed with Down syndrome, her physician suggested she obtain an abortion, telling her that keeping her baby would decrease her own quality of life. However, Baker didn't listen. In a letter to the doctor, which she posted on Facebook, she writes about the traumatic experience. She said, "I'm not angry. I'm not bitter. I'm really just sad... Instead of support and encouragement, you suggested we abort our child." Baker opened up about dreading her doctor's appointment's during that period, which she calls the "most difficult time" in her life. However, she has nothing but love for her daughter, adding, "Emersyn has not only added to our quality of life, she's touched the hearts of thousands." The letter has also touched the hearts of parents all over the world, as people connect with Baker's simple message of love.